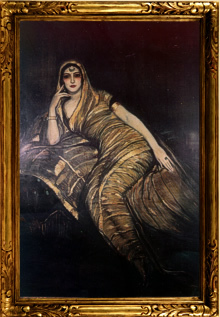 My name is Anita Delgado Briones and I am the Princess of Kapurthala. I was born in 1890 in Málaga (Spain), city in which my childhood went by in the company of my sister Victoria, my parents and my grandmother. Due to matters of life my family was forced to sell the business they had. And when, months later, grandmother passed away we decided to sell the house and start over elsewhere. This was the reason for leaving Málaga and coming to live to Madrid. In the capital my father could not manage to find work, and our situation was becoming more precarious, but, as you will see as follows, suddenly fortune smiled upon us in a surprising way. 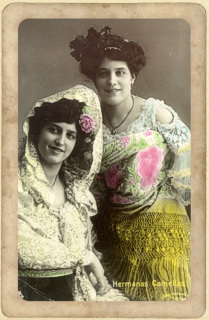 It all began with some dance lessons that the neighbour downstairs used to give us for free, because we could not pay… Some promoters that were scouting for new faces saw the two of us dancing and a few weeks later we were christened: Victoria and I were “Las Hermanas Camelias” - The Camelia Sisters. Those gentlemen had hired us for the sum of thirty “reales”- royals per night, to entertain as a support act and to dance between the various acts of the artists in the “Central Kursaal”. From the beginning we met a group of writers and painters who frequented the place. 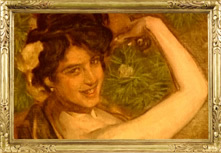 One of the latter, Anselmo Miguel Nieto was determined to paint me in 1905. The pose lasted three months. …Little did the kind Anselmo know that years later he would paint me again, at least on another two occasions . And little did I know the amount of times I would have to pose for painters and photographers throughout my life. The intellectuals from the Kursaal socialized on one of the tables with all the artists except with ourselves, as my father used to say.